Our society is suffering on many counts from a re-orientation away from living structure. The answer to choked cities is not sprawling suburbs, as was wrongly assumed after the Second World War. Suburban geometry has turned out to be fundamentally anti-life. It is stifling in practice, even as it looks superficially nice: clean air, in many cases green, spacious, etc. But there is an essential quality missing, and it has to do with the geometry itself. Without getting into theories of urban structure, here is a simple criterion for human design: "Shape a city around our children." Assuming that the interior of a house is designed to be friendly to a child (which more often today is not so, but that is another story), look at the immediate exterior of the house or building. Can a child go out of a door and play safely in the environment? Can he/she explore without the parent fearing for its safety? Can a child go anywhere on their own? No. A child is imprisoned within their house or fenced-in back yard. In our beloved suburbs, the fact that the geometry gives priority to highway-sized roads precludes any sense of safety for our children. So much for the annual upkeep of front lawns, bushes, curbs, speed bumps. Those elements are either fundamentally hostile to children, or they include band-aid solutions after the fact. But planners still refuse to change the codes to allow a genuinely child-friendly built environment. In most cases, they have absolutely no idea of how to achieve that. At the other extreme, the most inhuman environment for children is the skyscraper. Isolated from nature up in their upper-storey prisons, children lose all contact with nature and human reality. In his excellent book A Pattern Language , Christopher Alexander already gave the criterion of a four-storey limit for apartment houses, based upon the distance children can successfully interact with their friends and parents. In fact, Alexander based many of his patterns upon children's sensibilities, but no one paid much attention. Architecture and urbanism willfully embarked in the past several decades on designs that isolate and diminish the children's world to within one house or one room. Eastern Europe has several generations of persons who had their childhood wasted by living in monstrous high-rises. What is to be done? This brief note does not pretend to give the answer, but here is a starter. Grab a child (your child, or a nephew) by the hand and walk the project lot before even putting pencil to paper. Explain to your youngster that he/she needs to tell you exactly what is necessary to build there so that it is pleasant to play exactly where you two are now walking. (Also, try to imagine being that age yourself, if that is possible. Where is a tree, a paved footpath, a low wall for playing alongside and for sitting on? How about a gazebo here, for climbing up? None of these "useless" urban pieces should be placed on a plan by the architect - they wouldn't know where to put them, and even if built, will remain unused. A picture emerges that is totally distinct from the urban fabric we build nowadays. No wide roads, lots of footpaths, densely packed. Low walls, little things, connections. Houses that are oriented very differently from today's suburbia. Gone are the dangerous intersections, crossings, giant urban visual objects so beloved of post-war planners. Gone are the prison-yard concrete playgrounds, as the entire urban space becomes a playground. Even the useless expanses of lawn: ask the child where he/she wants to have lawn to run on. Certainly not everywhere - "No, we don't want lawn over there, we will never go over there to play," - but in very specific places, and it must go there and be protected by the surrounding structures. The reader ready to quit this letter will say: "Nonsense; no one has ever built such a city". Well, sorry, but much of the built urban fabric is built exactly in this manner. The developing world has cities, both traditional and informal, that exemplify what I'm talking about. Not that they are designed that way consciously, but simply because they have evolved in that direction. If those poor people can do it, why can't we? Perhaps because we are too rich, too arrogant, too caught up with ridiculous and destructive ideas of modernity, too dependent upon mechanization, too proud to admit we have destroyed our cities, and too proud to learn from poor people who may be starving but have a better urban sense that we do! Why are our societies so totally, obsessively, child-unfriendly, whereas the favelas of the world are great for playing in? Granted, we don't want the open running sewage or disease, but I'm talking about the geometry. They got it right. Are we capable of learning? You would be surprised at the blockage to learning that very intelligent people manifest because their mind is full of geometrical images of modernity. It is a fanatical conviction, and you cannot fight dogma with reason. The continued survival of the species depends upon our children. Surely, we need to build our world to optimize their experience? Not doing so goes against all religions as well as reason. Images of modernity compete (and have displaced) humanity's connection to the higher order of the universe. You're kidding, right? "Can a child go anywhere on his own?" Children SHOULDN'T be allowed to go anywhere on their own -- THEY'RE CHILDREN! As a parent (and hopefully as an adult), you bear the responsibility for the welfare of that child. If you can't commit to 18 years of care and feeding of your child - don't have them! In the wild, an animal stays with their offspring until the critter can make it on their own. If the critter gets eaten or killed, the herd is thinned. Perhaps we should take a hint from nature -- let the herd be thinned so that the simpletons eventually stop having more larvae. When I was a child, groups of children would go out and play, unsupervised, for hours. We would play on the street, play at the playground, play at a nearby field with trees and a stream, play on front yards, play on back yards. We would go for bike rides, packing sandwiches and fishing rods to see if we could catch mutant fish with three eyes in the creek near Pickering Power Plant. Once we found a shack in the woods and realized someone lived there. We would play Vietnam War, and invariably one kid would step on a mine and lose a leg just as the napalm bombardment was scheduled. "You go on without me," the valiant fallen soldier would gasp. "Save yourselves." The heroism was infectious: "No, we're not leaving anyone behind!" and we would fashion a crude stretcher out of fallen branches to ferry our fallen comrade out of the danger zone. Sometimes we would dare ourselves to taunt the big kids, ready to bolt for our lives if we went too far and actually made them angry. The big kids built a raft that they would use to go up and down the stream in the field near our house. When they left, we'd take it over and see if we could catch catfish with our hands without falling overboard. In today's sprawl suburbs, most of these activities would be strictly impossible. Worse, in today's cultural and media environment, with its steadily growing attention to violence that is actually in steady decline, the thought that parents would simply let their children play outside unsupervised is unconscionable. lol. I must admit, I've never "played" Vietnam War. Our games were a little less sophisticated - ball hockey, tag, hide and seek. But yes, they were done outdoors with no adults around. I must admit, Vietnam War sounds way cooler! Ryan, you pretty much just described my childhood, minus the Vietnam part. For us it was more about ponies and elves. Although I do recall singing Country Joe and the Fish with our stoned camp councillors. "And it's one, two, three, what are we fighting for? Don't ask me I don't give a damn, next stop is Vietnam!" Good times. The boys would build these amazing clubhouses. We'd build clubhouses too, but then we'd decorate ours with ferns and moss. The boys would come and beat us up and chase us out of our clubhouse. We'd hide in the bushes till they went away, then we'd go back to playing in our clubhouse. Jeez, maybe it was like Vietnam afterall. "And it's five, six, seven, open up the pearly gates! Ain't no time to wonder why, whoopee we're all gonna die!" We're a paranoid, irrational culture. We're so afraid of the bogeyman that we can't see the far bigger dangers that come with our car-centred society. It's called "Popsicle Factor" -- what's the likelihood that you'd allow your child to go unsupervised to the closest place where one can acquire a popsicle. Urban spaces make this easier. I grew up in both fairly dense urban and wildly undense suburban. 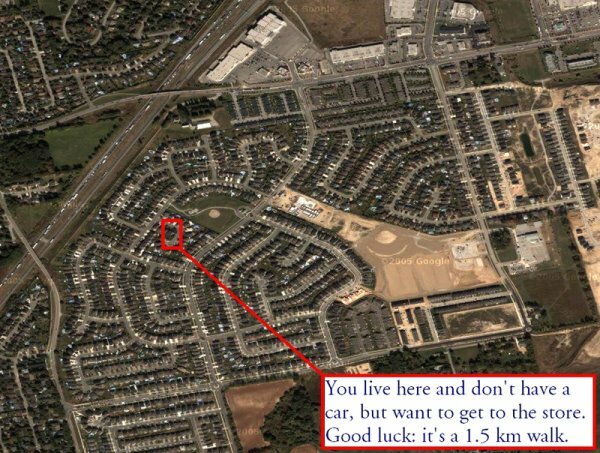 In one case, it was 300m to the corner store, and in the other... 2.3km. I had a childhood much like Ryan - and that's something I'd love for my kids. I do not want them to grow up wrapped in bubble wrap and totally unable to deal with the real world when they are on their own. Why do so many suburban kids fold when sent off to 1st year university? Why are they so socially hampered? The math is left as an exercise for the student. Many people move to the suburbs so they can afford a house (with a backyard) large enough for a family, located away from the homeless shelters and methodone clinics in many downtowns. If you ask people, most would say that the suburbs are better for raising kids. By the way, Ryan, when you were growing up wasn't Pickering a "sprawl suburb" of Toronto? Interesting how you have fond memories of growing up there but you always come out against other people who choose to live in, or develop, suburbs. In fact, I live in a suburban development right now, albeit a development that was built nearly a century ago. What I'm opposed to is sprawl - Suburban development with a strict separation of uses, not only between residential and commercial development, but also between fine-grained economic levels (e.g. $249,999 houses over here, $269,999 houses over there). The streets are all curvilinear and there are no walking paths between them. Further, the method of building sprawl these days is a heavy industry. All the trees are chopped down, the land is completely leveled, all the topsoil is scraped off and sold, and the construction vehicles compact the ground until it resembles concrete. After the houses are built, 18 inches (if you're lucky) of topsoil are placed back on top of the compacted ground, stray pieces of masonry, etc., and sod is rolled out. The land is no longer capable of supporting much more than grass. Trees and bushes die or are stunted, and there is no natural ecosystem to speak of. Even a decade or two later, industrial sprawl neighbourhoods don't look lived-in, because almost nothing can live. By contrast, the suburb I grew up in (and yes, it was a suburb), was built before the process was entirely modernized. There were corner stores, drug stores, local pubs etc. within walking distance of the houses, and all the streets were connected by a robust network of paths, parkettes, local schools, and so on that were in heavy use by children. Also, the land rose and fell and many original trees were left standing, so the neighbourhood was green and supported a variety of local wildlife - birds, squirrels, chipmunks, etc. There were still a lot of problems with that mode of development - it was hard to get outside our local neighbourhood without a car, bus service was terrible, there was absolutely nothing for teenagers to do - but it was an order of magnitude better than the hard-core sprawl being built today. Large, mature trees line the streets that clean the air, provide shade and comfort in the summer and even help to cool the houses. We're walking distance to a much larger range of amenities, including the Bruce Trail, Radial Trail and Rail Trail, four parks, three schools, a public library, a public swimming pool, a football field, several restaurants and pubs, a small grocery store, a deli, a bakery, and several other amenities. It is well-served by transit. It's a great place to raise a family and it encourages an active, healthy lifestyle. It also encourages children to be more independent and self-reliant instead of depending on their parents to drive everywhere and suffering the many health risks of spending large amounts of time in a vehicle (breathing poor air, being sedentary, and the increased risk of collision). Speaking of paranoid and irrational, I was just reading that the first two volumes of Sesame Street on DVD, covering episodes from 1969-1974, come with the following warning: "These early ‘Sesame Street’ episodes are intended for grown-ups, and may not suit the needs of today’s preschool child." It seems the grubby, sepia-toned, inner city neighbourhood where children interact with adult strangers, and monsters suffering from OCD and depression refuse treatment, sends the wrong message to kids today. And if you're looking for your Monsterpiece Theatre fix, you'll have to go to youtube. The adults only label wasn't enough to save it from the cutting room floor. Apparently even grown ups are susceptible to the corrupting influence of a pipe smoking monster. awesome video. too bad that's not on TV anymore. Ryan, not to be picky, but you made a comment above about your current neighbourhood being a suburban area that "in many ways improves further on the suburb I grew up in". Actually, your current neighbourhood would be older than the one you lived in as a child. Development and planning hasn't improved one bit over the past century. It's only gotten worse. The further back you go, the better the neighbourhood was designed. The newer ones are worse. Just semantics, I know, but I'd hate for anyone reading this to think that anything has actually gotten better in the way we build our cities and towns. To clarify: when I write that my neighbourhood today "improves upon" the neighbourhood in which I grew up, I don't mean it was built afterward (it's actually around a hundred years old), but rather simply that it is better at providing the connections and proximal mixed uses that a coherent, safe, friendly, and empowering community needs. Sounds like a lot of untapped talent out there.. maybe some of you can help us with our dilemma on Scenic and the Browlands. Most people owning all those huge lots want nothing to do with intensification and good planning. I live a few streets back and welcome these new propals. Finally when a developer comes along and agrees with some of us who favour townhouses and midrise condos, the land barons on Scenic are crying foul (Have you seen the dumb signs ?) The new wave of anti-sprawl is exactly what a community and neighbourhoods are all about.Smart growth is not a fad but our future. We are paving over everything but it is a credit to the new owners at the old Chedoke Hospital site that they are keeping the huge woodlot intact along with that little stream. Too bad their neighbours don't want anyone else living there. Pull up the ladder , Jack, I'm OK ! This educational campaign needs to be mapped out. Education comes from the latin educere, to draw out, and what better thing to draw out than natural human artistic sensibility? Yes, definitely get to the kids before the modernists do. Explain stuff to engineers, who have the intellectual baggage to appreciate Salingaros' arguments and are not often too beholden to mods' meme collections. Educate the clients too! It is a shame that clients pay so much and get so little in return. If clients knew how badly the mods are scamming them, McDonalds would be flooded with job applications from licensed "architects". Also be very aware that modernist architects, having nothing to stand on esthetically, scientifically or mathematically, systematically turn to bullying, psychological torture (yes! ever been to an architecture school or office? ), and dishonesty of every stripe to get their way. Capitalist butchery just makes it all worse. These are things honest insiders know perfectly well. If you deny this then you are certainly not an architecture insider. This is a paradigmatic shift. Kuhn explains that old modernists will never be able to make the switch. They will insist on their flat earth theories to their very graves. There is nothing at all to be gained by addressing them. Additionally human rights crimes (as listed by the UN) are routinely committed in the modernist architecture establishment. There can be no peace without justice. Charlatans are tuition thieves and sociopaths and need to be treated as such. Beware of the classicist milieu as well -- a lot of cryptofascists hang out there also. There can be no cure for a meme viral infection without a good diagnosis. And the extent of the putridity of the modernist architecture establishment needs to be exposed in full before peace, truth and justice can be made to prevail.